The hovercraft was invented by Sir Christopher Cockerell whilst he owned and worked at Ripplecraft, the boatyard in Somerleyton. From 1953 to 1956 as well as designing and building hire craft for the Broads Sir Christopher “worked on the problem of making boats go faster”. He was attempting to make boat propulsion more energy efficient and one of his experiments was to inject air under the hull of his launch Spray. From this work he developed a working hovercraft model. Unable to take the development further without aid Sir Christopher demonstrated the model to Lord Somerleyton on the lawn at Somerleyton Hall. Lord Somerleyton was impressed and arranged for Sir Christopher to demonstrate the model to Lord Mountbatten who was First Lord of the Admiralty at the time. Eventually the National Research & Development Corporation backed the project, Sir Christopher and his family moved to the South Coast and the prototype SR-N1 was built and crossed the English Channel on 25th July 1959 to widespread acclaim. On 3rd July 2006 a roundel was unveiled in the lawn at Somerleyton Hall to mark the spot where the hovercraft model was first demonstrated to the then Lord Somerleyton. The unveiling was conducted by Sir Christopher’s daughter Frances (Mrs F K Airy), who then made an interesting speech drawing on her recollections of the early 1950’s and the background to what became pages in our maritime history. 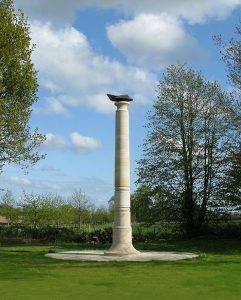 On 4th June 2010 (the centenary of Sir Christopher’s birth) his daughter, Frances Airy, unveiled the hovercraft celebratory column at Green Corner, Somerleyton. The unveiling was preceded by a fly past by a Spitfire in honour of Sir Christopher’s WW2 work for Bomber Command.